Even in today’s “let’s be careful not to offend anyone” atmosphere, sneering at the obese can still be done casually and largely without recrimination. Yet it still feels transgressive just to say the name of Neil LaBute’s 2004 play out loud. Fat Pig. Because it’s a tip-off that somebody is going to be very cruel to somebody else. Nevertheless, this is one of those rare plays that gets you thinking and forces you to look at your own assumptions. But it’s also a comedy, and it’s a tribute to LaBute’s talent that he can keep us laughing and horrified at the same time. 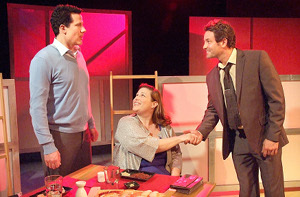 Fat Pig is at the Hudson Mainstage in Hollywood through June 1. In LaBute’s world, men are made out to be dedicated connoisseurs of savagery and viciousness. In the acclaimed 1997 movie In the Company of Men, which LaBute wrote and directed, two male office buddies torment a deaf woman, playing cruel tricks on her. In Fat Pig, it’s a similar setup, but this time, one of the guys, Tom, falls for a super plus-sized woman, Helen, whom he meets while she is dispatching multiple slices of pizza at a fast-food joint. They hit it off, but when his co-workers find out whom he is dating, they are by turns shocked, rude and dismissive. The twist this time is that one of Tom’s co-workers is Jeannie, a hot, buff babe who is romantically interested in Tom but frustrated by his indifference to her, and she can’t understand what he sees in the new heavyweight contender. As the catalyst that ignites all the (re)action, the zaftig Helen would seem to be the person we are supposed to focus on; but this play is really about Tom. Throughout the first act, Tom seems to be a nice, caring guy, a guy who is willing to go beyond looks and judge a person by who they are on the inside. But by the second act we begin to understand that Tom has his own set of issues that will eventually torpedo his relationship and his happiness. The problem is that Tom is a coward and is ultimately unable to withstand the negative judgments and disdain of others. He hides Helen away and only wants to be with her in private. He is too embarrassed by her to go fully public. What makes this production (directed by Alexis Jacknow) work so well is the naturalness and chemistry of the two male leads. Jonathan Bray presents Tom as a man beset by love, confusion and shame all at the same time, and it doesn’t feel like acting to see him struggle with it. Likewise, Nick Stabile initially plays Tom’s pal and office mate Carter as an obnoxious jerk, and there doesn’t seem to be much more to him until he starts talking about his fat mother (“a sumo wrestler in a housecoat”) and about how important it is to abide by the things that make us happy, no matter what. The production design is spare, but that keeps us focused on the excellent acting. Kirsten Kollender as Jeannie has the least nuanced role as the spurned lover. She is naggy and annoying and that’s about it. I suppose she has to be for it to make any sense why Tom would choose Helen over someone as va va voom as her. Unless, of course, he has a sexual fetish for fat women, but I don’t see anything in the play that supports this idea. Helen, on the other hand (played ably by Deidra Edwards) comes off as a self-confident woman who admits she loves food and has come to terms with her abundant weight. Even though we “know” the play is about Tom and his weakness, we still cannot escape confronting our own prejudices about a fat woman. Edwards’ mounds of flesh are served up for our consideration — scene after scene we see increasingly more of her, culminating in an especially revealing intimate bedroom scene. So this is not one to bring the kids to. But any adult ought to be able to appreciate it on a number of levels — first as a comedy, there are a lot of laughs to be had. Going deeper, it asks how courageous you are about the things you value, even when society does not approve. Finally, it works as a mirror with which to examine your own reflexive instincts about obesity, and the opprobrium of our health- and body-fixated society at large. LaBute is a talented playwright with an important voice. He delivers where most others just promise. 6539 Santa Monica Blvd., LA 90038. Tickets are $30. Call (323) 960-7788, or visit www.plays411.com/fatpig. Jacknow is a great director. Can’t wait to see this.